Melt the butter in pan and cook the onions on medium heat for 10 minutes or until they are golden and soft. Remove from heat and add olives, parsley, pepper and salt. Let it cool down. Cut each puff pastry into half and then half into 5 triangles. Place a little of the onion mixture at the base of triangle and roll up towards the point, close the filling into croissant shape. 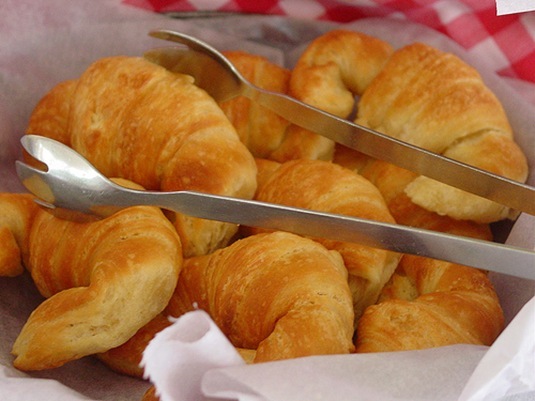 Place the croissants into baking tray and refrigerate them for 30 minutes. Preheat the oven at 200 degrees. Brush each croissant with beaten egg and bake them for 20 minutes, or until they are puffed and golden. Next post: Zebra Fish Blindness Cure?